Term begins this week and many students will be plunged straight into exams. 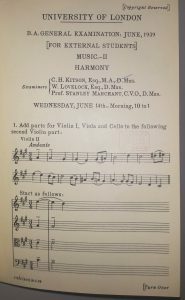 We’ve had a look through the University Archives to find out what the students of yesteryear faced when they turned over their papers. Prior to 1948, University College Nottingham had no power to confer degrees. All qualifications (and therefore, examinations) were issued by the University of London. This paper is marked for ‘external’ students (i.e. one at a University college rather than one who attended the University of London itself). Proof that the modern focus on the Tudors and Stuarts is not a recent phenomenon! 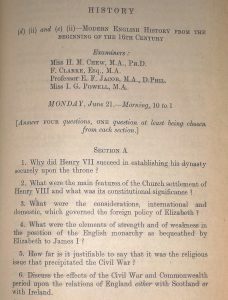 Some of the exam papers for European history asked students to comment on extracts from primary sources that were written in the original language – and occasionally assessed their translation of the sources as well as their analysis. The only postgraduate exam paper featured comes from Education. Nottingham has run teacher training courses since the 1890s. 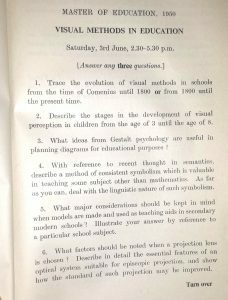 As well as the theory papers we also have records from the practical teaching component in local schools. 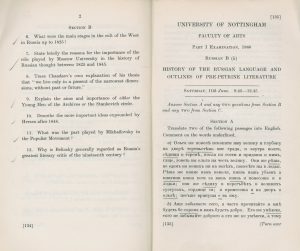 The University has taught Russian for over 100 years, and has one of the oldest Slavonic Studies departments in the country. Exams were a mixture of Russian translation and essay questions on Russian culture, literature, and history. This essay question on the ‘Young Men of the Archives’ caught my eye. 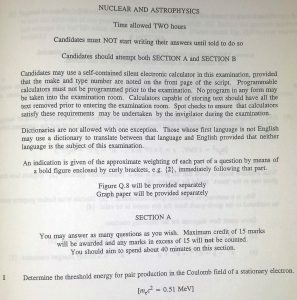 Some of the current Physics undergraduates were born the year this paper on Nuclear and Astrophysics was set. The references to ‘self-contained silent electronic calculators’, some of which were so advanced they were capable of storing text, date it more than some of the arts and humanities papers. Historic past papers for various faculties are available from Manuscripts and Special Collections on King’s Meadow Campus. Selected past papers for 2014 and 2015 are available for students via the Intranet Portal, with instructions on how to search for your modules here. Exam information and timetables are available online and students can find places to revise and free computers across all campuses from the Library’s Study Anywhere page. Good luck to everyone sitting exams! It’s a nerve-wracking time, but if you feel overwhelmed then don’t forget that the University’s Health Service can provide help and advice on Exam and Assessment Stress.